TooManyItems Mod is now fully compatible with Minecraft 1.11.2 and 1.10.2,1.7.10. In other words, it is an incredibly useful in-game inventory management mod with many additional features. Once you have installed the TooManyItems Mod you can access it by opening your inventory. This is the perfect mod for players who want all the convenience of creative mode in Minecraft, regardless of the gameplay mode they choose. However it doesn’t work in multiplayer servers, unless you are the owner or an administrator, but it is the perfect utility for people playing in single player. 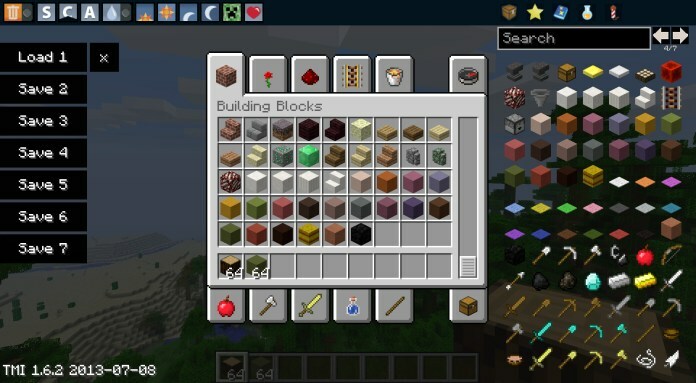 To the right of the normal inventory there is a searchable list of all minecraft blocks and items, including those from any other mods you have installed. Simply click a block or item and a full stack will be added to your inventory. You can add items to a favourites list and even create saves of the inventories you use most often. In the top left hand corner there are a number of useful buttons that allow you to change the time, change your gamemode and even fill your hunger and health. Follow this short installation tutorial to know how to properly install TooManyItems Mod in Minecraft. Download the TooManyItems Mod on page below. Place the mod you have just downloaded (.jar or .zip file) into the Mods folder. Need help? Feel free to leave a comment below this article.